IF ZOMBIES EVER ATTACK JUST GO TO COSTCO... THEY HAVE CONCRE - ProudMummy.com the Web's Community for Mums. IF ZOMBIES EVER ATTACK JUST GO TO COSTCO... 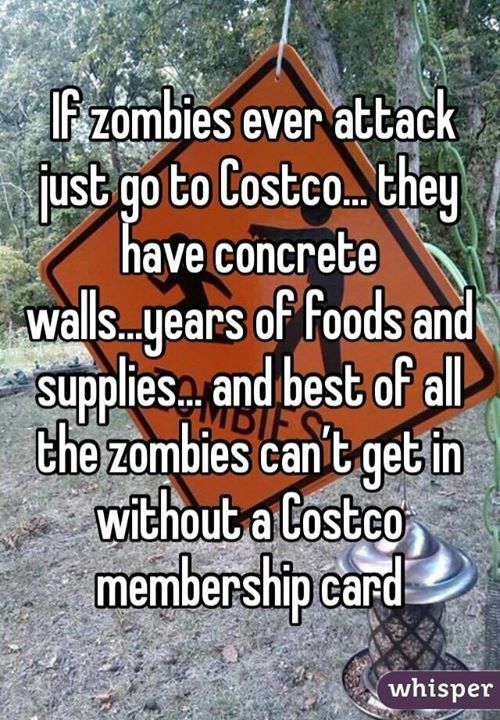 THEY HAVE CONCRETE WALLS...YEARS OF FOODS AND SUPPLIES... AND BEST OF ALL THE ZOMBIES CAN'T GET IN WITHOUT A COSTCO MEMBERSHIP CARD.